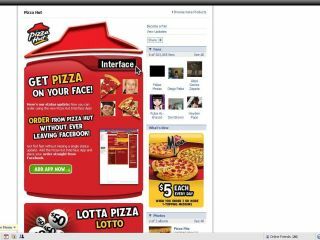 Pizza (or Pasta) Hut has decided that people are just not lazy enough these days, and has unveiled an application for Facebook that lets you order pizza directly. So now, when you're mid-way through a poking frenzy while ninja-pirate baiting, writing on walls and checking out what your friends are up to (the same thing), you can order food too. Called the Pizza Hut Interface (cleverly), you can order pizza, pasta and wings, though probably chicken wings and not actual units of propulsion. The app will even remember what you had last time you ate, which means the end of all that disgusting deciding for yourself. Whoopee. Pizza Hut recently sold its millionth pizza online as people are clearly tired of using the phone, and the new application celebrates the new level of laziness. The app is available now, so hop on your PC and get ordering if that's what you're into, although it's currently only available in the US. But don't worry, the UK can't be too far behind!